The Leupold GX-4 is Leupold’s top-of-the-line range finder. Functionally, it’s equivalent to the GX-2, with advanced features such as slope compensation, Prism Lock, and True Golf Range™. But, like the Leupold GX-3, it sports a sturdier, solid aluminum frame and a red OLED display that’s very easy to read against dark backgrounds. It’s also every bit as stylish looking. Like all the Leupold golf range finders reviewed, the GX-4 is lightweight and compact, and has vertically-oriented optics that allows the device to be used with one hand. Leupold took a chance in the design of the GX-4. The device can operate as a tournament-legal range finder that provides only line-of-site distance measurements. By switching out the chrome faceplate for the yellow one (which acts as a smart key), the unit can be converted into a slope-compensating range finder that also provides Leupold’s signature True Golf Range™ and Club Selector™ features. Unfortunately for Leupold (and golfers, in our opinion), their design gamble didn’t pay off. The USGA ruled the GX-4 illegal for tournament play, regardless of whether it’s used in standard, line-of-sight mode or slope-compensating mode. Since this is a light weight range finder you need to know that it will be much easier to work with. You don’t need two hands to use the GX-4 and you can easily carry it in a pocket or on the side of your bag. It is not like some of the larger range finders that take up an entire pocket in your golf bag. The Leupold GX-4 features a target range up to 800 yards and it can catch a reflective prism up to this yardage as well. It will allow you to shoot the distance to any pin within 450 yards, which is plenty for any hole on any golf course. You can easily grab the pin with the GX-4 due to the pinseeking mode, and you will have accurate distances within 1 yard plus or minus. It is not necessary to have a range finder that can grab distances over 300 yards. There are very few shots on the golf course you are even going to hit that far. You need to have a range finder that can acquire an accurate yardage from 300 yards and in, which the Leupold GX-4 can easily do for you. The magnification of the Leupold GX-4 is not as high as some of the competitors, but 6x is plenty for nearly every shot you are going to have on the golf course. Most of the range finders with the ability to magnify higher only go up to 7x anyway, and 6x is pretty close to the competition. Plus using a range finder with a higher magnification requires a more steady hand and this is just not something that everybody has. 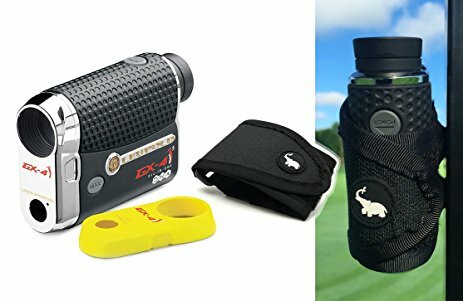 If you know keeping your range finder perfectly steady is going to be difficult, then you should not be concerned with having a range finder over 6x for the magnification. The Leupold GX-4 allows for both PinHunter and Prism Lock modes for distances. The PinHunter mode will allow you to fire a laser beam directly at the pin through the crosshairs. This will allow you to grab an accurate distance as the laser bounces off the pin and returns the yardage for you. When using this mode you will be able to avoid many of the things in the background when trying to get an accurate yardage to the pin. If you are playing on a course with prism targets on the pins you can use the Prism Lock mode to grab these reflective prisms much easier. You can simply hold down the top button and scan the area where the pin is. Once the range finder locks in on the prism it will return an accurate yardage for you and you will be notified with a beep. The display will even freeze at this point so you know you have the perfect yardage. Leupold GX-4 Review ImageLeupold has produced many products that are perfect for the golf course. They are known for creating very durable and rugged range finders, and the Leupold GX-4 is no exception. The aluminum housing is built to last, and the body is very visually appealing. The best part is Leupold did not go with cheap optics and instead they stuck to the same high standard as the rugged structure. They chose precision glass, cutting-edge coating, and provided a low glare, scratch resistant set of optics for accurate ranging. Acquiring distances can be done very fast and just by scanning a range you can find many distances from one target to another. The red OLED display makes it very easy to read against even a darker background. You may have to go to an actual battery store to find the proper battery for the Leupold GX-4, but you will only have to replace it once every few months and that is assuming you play golf on a very regular basis. If you only play on the weekends you may only need one battery per year since these batteries last much longer. The functionality and the accuracy of the Leupold GX-4 are nearly perfect for a range finder. This is also one of the easiest range finders to use. One thing that may be considered a negative is the size. Some golfers may prefer a larger range finder with a bit more magnification, but if you are looking for a smaller range finder, then the GX-4 is an excellent. Also, we find it a bit disappointing the Leupold units only have a 1-year warranty. Given their quality and reputation, we think a 2-year warranty, as offered by Bushnell, would be more appropriate. The buyers of the GX-4 have left many very positive reviews. This is not much of a surprise considering it is the top of the line from Leupold.